The mouth of the River Raisin was once home to abundant lotus beds and sturgeon, among many other native wonders. But the Raisin has also become a major port on the western side of Lake Erie. In Monroe, mills gave way to automobile manufacturing plants and eventually became home to one of the largest energy-generating plants in Michigan. The cost of doing business in the midst of this transformation resulted in some chronic pollution problems, including PCBs in river sediments and an on-going need to dredge the lower channel for ship traffic. In the 1930s, as a Works Progress Administration (WPA) project, a series of dams were constructed to carry sanitary sewer across the River Raisin’s bedrock bottom (refer to Aerial below). But the dams have blocked boats and fish from travelling back up the Raisin from Lake Erie. These conditions have degraded the environmental quality and potential of the river in Monroe. The United States Environmental Protection Agency (EPA) has listed the mouth as an Area of Concern (AOC) with “beneficial use impairments” (BUIs), including degradation of fish and wildlife populations and loss of fish and wildlife habitat. As part of this listing process, a Remedial Action Plan has been developed by the EPA, Michigan Department of Environmental Quality (MDEQ) and the River Raisin Public Advisory Council to fix or remediate these conditions. Starting in the summer of 2012, the River Raisin Legacy Project commenced to invest more than $23 million to enhance the environmental and recreational opportunities in the River Raisin and nearby Sterling State Park, creating fish and small boat passage from Lake Erie to approximately 23 miles of the lower River Raisin by modifying or removing four low head dams in Monroe, opening 3.5 miles of river channel for passage . 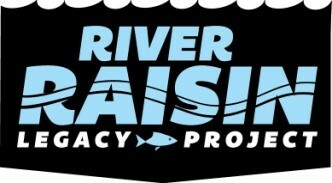 Reclaiming free passage in the River Raisin for fish and small boats, we hope this project will play a role in the extensive effort to -restore, preserve and improve the natural environments vital to this community. Fishing, wildlife viewing, bird watching, canoeing and kayaking will all emerge as never before in our lifetime. Click links below for more information and to download our free Field Guide. More videos on the River Raisin Legacy Project in the City of Monroe can be viewed below.